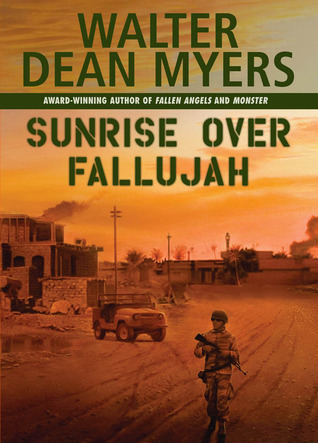 Today is week 3 of our group read-a-long of Sunrise Over Fallujah by Walter Dean Myers. This week we read pages 153-214, and we hope you’ll leave your comments and/or answers to the questions after the post. Click here for Week 1. Click here for Week 2. We welcome you to post your thoughts on your blog and provide a link or just type your thoughts in the comments section of the discussion post; whatever works best for you. You can answer our questions or just discuss whatever you found most interesting in each section. 1. Birdy can be seen passing the time with his fellow soldiers — whether playing cards, watching TV, or playing soccer against Iraqi children — but the war continues outside the walls of their “green” zone. How would you characterize his situation as compared to the other soldiers that constantly face violence and attacks? S: Many other books I’ve read about war tend to show the macho side of war and its soldiers, but Birdy still seems innocent and naive…still very much a scared boy. He’s seen quite a bit of action, but he still seems removed from the fear or the gut reaction for revenge that many novels depict. It’s tough to get a read on him. On the other hand, his unit is supposed to be focused on rebuilding Iraq and helping the people get what they need in terms of medical supplies, etc. Perhaps that’s part of the disconnect — he’s not directly involved in the combat — more like part of the collateral damage. 2. At one point, Birdy talks about how he’s always reading the newspapers about the war, even though he’s there. He doesn’t seem to know why he’s reading the papers; why do you think he’s reading them? S: It seems to me that he’s not getting the answers he wants from his superiors so he’s taken to the papers and television to find them. Whether he’s looking for ways to identify the enemy or just to understand the warfare he’s engaged in, I’m not sure. But his efforts to find answers are likely to fall short if he’s relying on the papers. 3. We’re nearing the end of the book, so what are your thoughts about the book at this point? Do you like it? Why or why not? S: I’m on the fence about this book. There are parts that I like — seeing the human side of the war, the interactions between Birdy and the Iraqi people, the helpful aid given to the Iraqi people — but then there are parts I don’t like — like the disconnect I feel between myself and the characters and the distance between the characters themselves. Birdy doesn’t want to get too close to his unit-mates and that’s evident. But it seems like they are all staying at arms length. And there’s no direct crisis or trauma that really brings them together, except maybe the aftermath of member’s death — but we haven’t seen that yet. 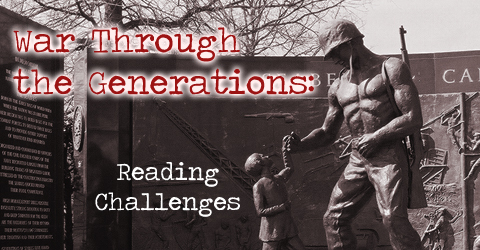 If you have discussion questions for the third section, we’d love to hear them. Post your own questions or comments here or on your own blog. We’d love to read your thoughts…. 1. Actually, the depiction is fairly accurate not only for his unit but for most units. The fact is that even for combat units in Iraq, the time in danger was relatively small. Even if not in the Green Zone, you would be in a safe environment much of the time. Once the fighting was over (and the book basically jumps over the combat phase of the invasion), the dangers came from IEDs. It is not unusual in wars for long periods of boredom to be followed by short bursts of incredible tension. 2. This is classic “fog of war”. Ironically, his relatives back home would have been more clear on what is going on in Iraq than he would have been. Also, newspapers would have been a tangible connection to home. I actually did not pick up on him doing a lot of newspaper reading. This seems odd as I would think modern American warriors would be uninterested in the print medium (like their peers back in the States). Besides, the troops would have likely had access to CNN and Internet sources. Why wait for a week old newspaper from home? 3. I have finished the book so I will reserve my opinion for the last post. I disagree that Birdy is stand-offish. This attitude is common in units that suffer consistent losses (at least in Hollywood movies), but his unit does not fit that situation. He has no real reason to avoid bonding and I don’t get the impression that he is doing that. I believe few modern American soldiers dispense with the advantages of comradeship for fear of heartbreak. If anything, Birdy has low self-esteem and is shy. That is different than being aloof. I find his bond with Jonesy and Marla is strong. It is obvious he would die for them. Kevin, thanks for joining in and sharing your thoughts. I haven’t felt a connection to Birdy…I do think that he’s shy…but I’m not sure I see evidence of low self-esteem other than his fears about the war and his ability to tell the difference between the enemy and those in need of aid.